The Kingdom of Tonga hosts the Green Climate Fund’s Structured Dialogue with the Pacific during four days. This meeting is organized in collaboration with the Governments of Australia. It aims to accelerate the implementation of GCF projects and programmes approuved in the Pacific. The meeting has been launched by the Deputy Prime Minister of Tonga and Minister of MEIDECC, Honourable Siaosi Sovaleni on July 18 at the Faónelua Convention Centre. The dialogue will open with a High-Level Segment at Faónelua followed by a three-day Technical workshop at Tanoá International Hotel. GCF Board Members, Secretariat Staff, ministers of countries in the Pacific, senior government officials, including representatives of the GCF National Designated Entities and Focal points, private sector representatives and civil society organizations are attending the meeting. The four- day gathering is an opportunity for countries and Accredites Entities to share their experiences in various programmes fund by the GCF. According to the GCF Communication department, the dialogue is expected to help Pacific Island countries identify Accredited Entities and private sector organisations to partner with. It will help identify Accredited Entities, including private sector partners to support the project proposals to fight climate change. 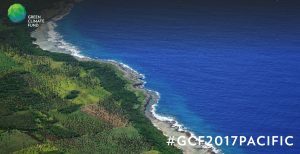 This dialogue is part of the sustained development of a Regional Roadmap initiated in 2016 GCF Regional Meeting which has to help strengthen Pacific Island countries engagement with the GCF.